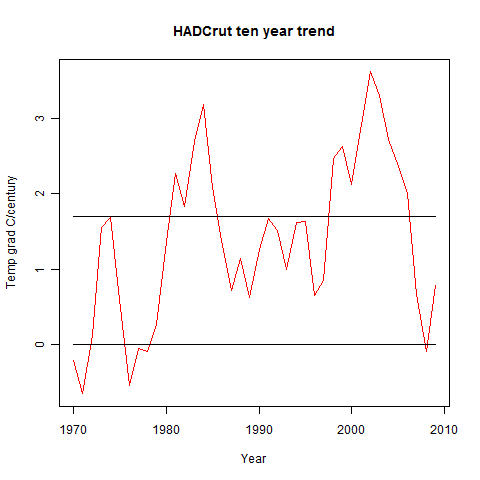 "Has the rate of warming continued unabated, or has there been a pause in the warming?" Judith has now offered a criterion: "Here I define “pause” to mean a rate of increase of temperature that is less than 0.17 – 0.2 C/decade." "Note that the short time scales considered here preclude determination of a statistically significant trend at the 95% confidence level, although lack of statistical signficance does not negate the existence of a pause as defined here." Well, it occurred to me that if any drop, significant or not, below, say, 0.17C/decade is a pause, then we'd be seeing a lot of them over the years. So I thought I would check that out. The period of time Judith and others is looking at is about ten years. 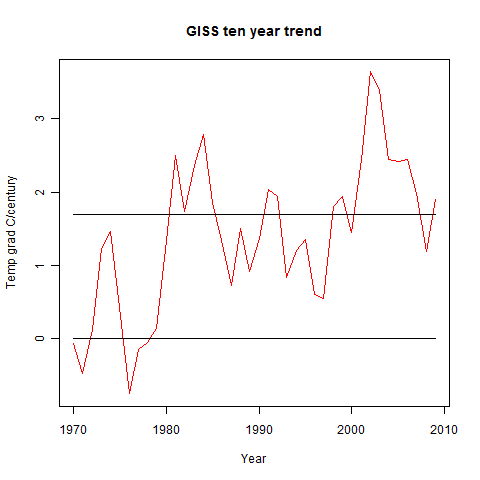 So lets look at ten year periods in the recent past, and see how many "pauses" show up. So a first surprise - BEST isn't currently showing a pause at all. Nowhere near. Muller was right - and Tamino noted this. The BEST data shows a strong rise right through this decade. 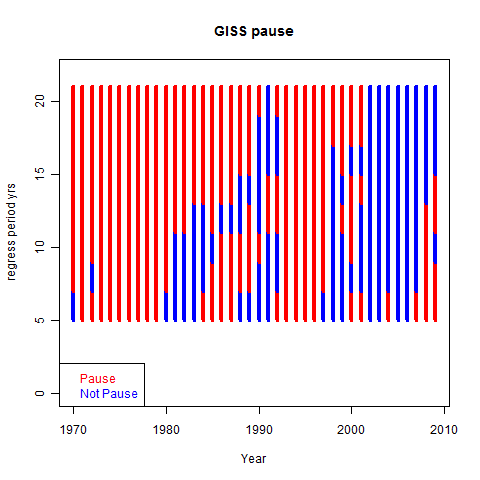 Quite a lot of pauses - in fact, if that's the criterion, more years showing a pause than not. Ten years is a popular period to examine at the moment. It's long enough to have some plausibility, doesn't tangle with the peak of 1998, and can be manoeuvred to show somewhat reduced warming. But I wondered what might have been the perspective in previous years. How hard would it have then been to show reduced trends? Is the present period really different? So I made a plot of the various intervals that could have been tried, from six years to twenty, in two-year increments. 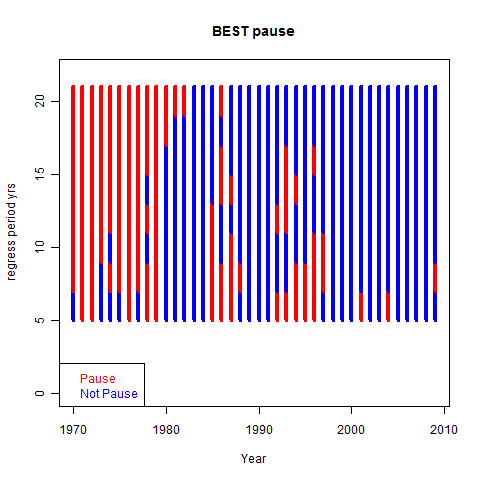 The following plot shows which time intervals, looking back from each year, would have met the "paused" criterion. Again trying to see if there really is a pause now. The length of trend period, looking back, is shown on the y-axis. 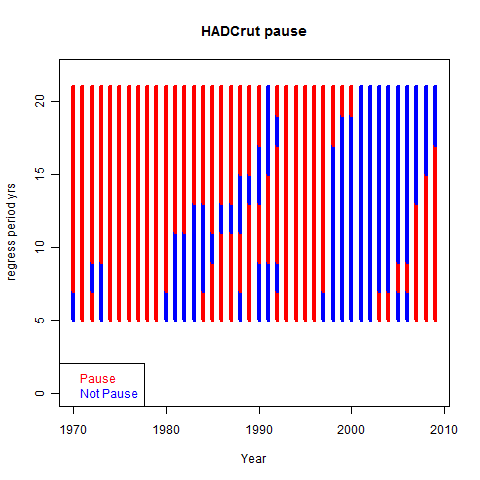 The corresponding color shows whether that choice of trend interval, ending in the x-axis year, would have been declared "paused". So first BEST again. The surprise is that it is quite hard, in this decade, to meet the paused criterion (slope ≤1.7C/century) with the BEST data. Just one or two 6-8 year periods satisfy it. It gets progressively easier going back, and of course in the 70's looking back, warming of 1.7C/century was rarely attained. To explain further, if you look at the column above 2009, the bottom blue part says that the previous 6 years shoiwed a trend above 1.7 C/century - not "paused". The next red part says the previous 8 years (2002-9) showed a trend less than 1.7, but for 10,12,14,16,18, and 20 year periods, again, blue - no pause. The columns above other years can be read similarly. But only very recently, and there's a lot more "pausing" in the '90s.With the longer periods pre-2000, red doesn't really mean a pause - it's getting back to the period before the current warming really started. 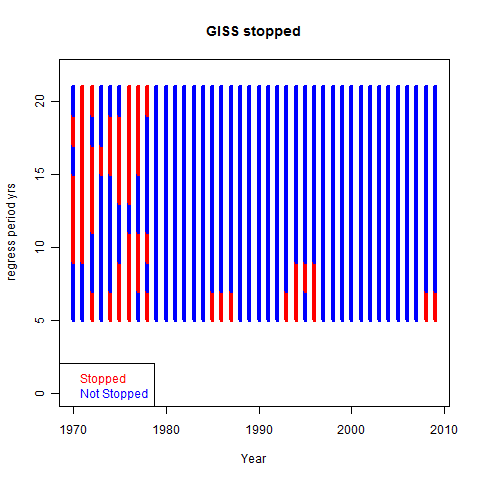 Two of Judith's criteria for slope without statistical test show no established region where they are met, and show no real tendency, independent of choice of interval, to occur in recent years. A related post (from over a year ago) concerning trends in this decade is here. That's a nice compact way of showing a lot of information in an easy comprehensible way. As for Curry, she could just as well say that there is no scientific basis that unicorns don't exist. That might be more interesting than what she's normally on about. I think there is a certain danger in overanalyzing data without considering the underlying mechanisms that are driving variability. We had two eruptions, El Chichon in 1982 and and Pinatubo in 1991, which lead to periods of global cooling. What is remarkable (to the extent anything is remarkable about it) is the "flattening off" of temperatures from 2002 to circa 2010 is the lack of any immediately obvious mechanism to explain the cooling. And by "obivous" I mean something like a big bang like a volcanic erruption, not changes in global sulfate emissions for which we lack the data to confirm or deny their presence. This is OT but I started to think about Steve Mc's discussions of menne's algorithm for steps in temp data etc... And it got me thinking about a potential method for calculating global temperature that might alleviate some of the common issues. Instead of treating any individual station as a station with a continuous series and combining them together in a gridcell like other methods do or in the way Berkeley does... Why not treat things similar to a GIS framework and treat every monthly temperature measurement as a point on a map with the absolute temperature and incorporate elevation data with a lapse rate model into kriging (or some other interpolation method) to model temperature on the regional scale. To get the global average you could just average the raster cells generated using the kriging model with the elevation lapse rate model surface? For the last decade or so, the trend in solar is down, ENSO is down, methane concentrations have been flat (until ~2007), and aerosols have started upwards again. The expectation should be less warming than would be expected if these things were not true. "What is remarkable (to the extent anything is remarkable about it) is the "flattening off" of temperatures from 2002 to circa 2010 is the lack of any immediately obvious mechanism to explain the cooling." It can be easily explained by lower TSI and MEI. "And by "obivous" I mean something like a big bang like a volcanic eruption"
TSI (actually sunspot number which is a terrible proxy for TSI) and MEI are not "big bangs". Your statement makes less sense now. Basically you're saying that it is remarkable, (but with a clause saying it isn't really remarkable) that the 'flattening' can't be explained by big bangs that haven't been observed. It's a pointless statement of the kind Judith Curry says. Why does the 'flattening off' have to be associated with a 'big bang' of any description. Why can't it just be associated with ordinary, easy to explain things - what most people would call 'obvious'? narrowing the field of 'obvious' to big bangs is a useless investigation technique. I have to agree with Nathan there. That's what statistical significance is about. If it's significant, then a lack of explanation is worrying. If it isn't, it isn't. Now I'm no fan of rigid adherence to levels like 95%, and I'm happy to agree that as such levels are approached, the desirability of an explanation gradually increases. But I haven't seen a convincing demonstration of "significant" deviation from expectation. And Judy, at least, isn't claiming one. Okay, if there is no scientific basis for claiming AGW has not stopped in this "pause", then why do all of the papers I can find that predicted a "pause" in the 2000s say AGW does not stop and temperature will eventually rise. Did they have no scientific basis for saying that? If so, how did that get past peer review? Nathan: Why does the 'flattening off' have to be associated with a 'big bang' of any description. Why can't it just be associated with ordinary, easy to explain things - what most people would call 'obvious'? narrowing the field of 'obvious' to big bangs is a useless investigation technique. I never said it didn't, only that it's remarkable---worthy of remark. tamino posited one explanation, others have been presented too. All I'm trying to say is there are a number of plausible models for the flatting off in warming, and we don't know at the moment which of these putative models, if any, is the correct explanation. That it is "worthy of remark" or "remarkable" is hardly a question---otherwise what's the explanation for why there are so many papers published on this topic? NIck: I have to agree with Nathan there. That's what statistical significance is about. If it's significant, then a lack of explanation is worrying. If it isn't, it isn't. Well Nathan isn't saying all that much, so it's pretty easy to agree with him. As I said "We had two eruptions, El Chichon in 1982 and and [sic] Pinatubo in 1991, which lead to periods of global cooling." These are well established events, there is no similar well established event for e.g. 2001-2010. You can't really look at the cooling events during those decades, associated with large, well established events to understand whether the cooling or lack of it during the last decade is interesting or not. Hence, my original comment on "I think there is a certain danger in overanalyzing data without considering the underlying mechanisms that are driving variability." My point is exactly that you do need mechanisms (and several have been proposed) to explain any observed data, but what we do know is that whatever behavior didn't have associated eruptive events that led to global cooling. It becomes overanalyzing if one tries and look at the prior two decades to decide what is typical, when there are non-typical events for those decades, not shared by this one. JCH, I pretty much agree with your comments... I wouldn't say any of those papers really predicted the "pause", just the return to warming afterwards, right? I think we basically all agree that to say "there is no scientific basis" implies the absence of physical mechanisms that could serve as a "basis" for explaining the "absence of warming". I would say they did, but I can't read this science stuff worth a hoot. Keenlyside et called it an offset, which has, I think, the proper message. Thanks for the reference JCH. "These are well established events, there is no similar well established event for e.g. 2001-2010. " "My point is exactly that you do need mechanisms (and several have been proposed) to explain any observed data, but what we do know is that whatever behavior didn't have associated eruptive events that led to global cooling." Who cares if there were no eruptive events? "Well Nathan isn't saying all that much, so it's pretty easy to agree with him." Good post, but it must have been seen as offensive: the link to your blog has just been suppressed at Judith's, as it already happened with the link to Bart's. Thanks for the tip. I guess she takes a tribal approach to blogrolls - I don't. I think they are for information. Maybe she just considers the use of ad hominems in appropriate. Are you saying that Nick, in this post, is indulging in some form of ad hominem? I fail to find it but you are very sensitive to this sort of thing so perhaps you could be a bit more explicit for those of us less sensitive sorts. Bu the ad hominems in the comment section are kind of hard to miss actually. Let me know if you need help finding them, I'm here to serve. "As I said in the previous thread, I think Judith likes to make provocative statements and see where they lead. As I also pointed out, it's good for her ratings. ;-)"
Nick, thank you for helping me to find the BEST temperatures at the Berkeley web page. I made a plot similar to the first plot you have in this blog posting, BEST ten years trend. But I have to process 11 years to get the same values as you have in your plot. As an example, the value at 2009 in my plot is the slope when doing a linear regression analysis of the years starting at 1999 and ending at 2009, i.e. 11 years. It may be a matter of definition. 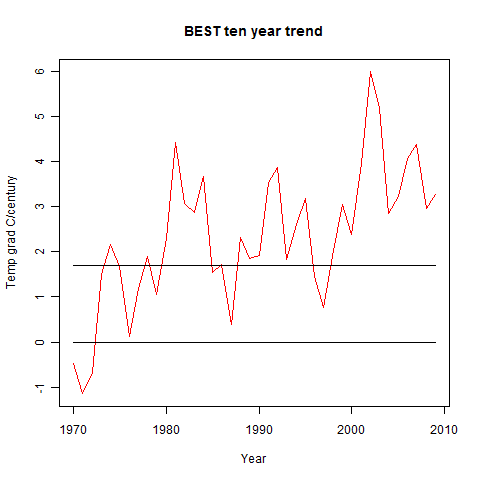 In a ten year trend calculation, do you use ten or eleven yearly temperatures ? You're right - I used an inclusive sequence (by mistake), so I calculated 1999:2009. I'll re-do the graphs. On the blog roll at Climate Etc., J N-G's link is gone. A picture of statistically significant warming. GMST trends - a cherrypicker's guide.